Once you have let Logicbroker know that you'd like to integrate with Magento, you will receive access to our Magento extension. 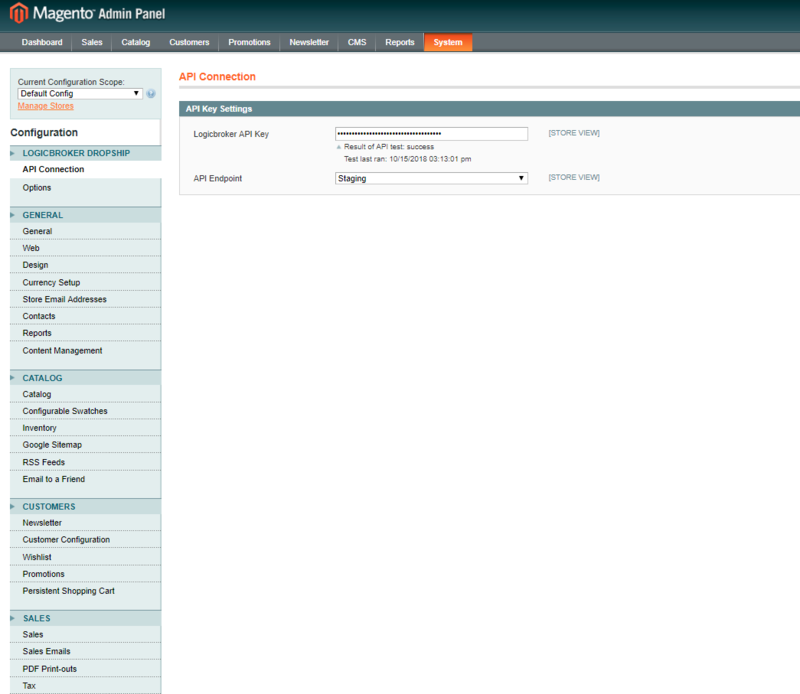 This can be installed by extracting the files into the root Magento directory on your server. After the extension has been installed, you will see a new Logicbroker tab appear on the Configuration page. There are two configuration tabs for the Logicbroker extension: API Connection and Options. Now that you have the Logicbroker extension installed, you need to configure it with your Logicbroker API key before it can communicate with the Logicbroker system. This API key can be generated and found in the Logicbroker Portal. When you add your API key to the configuration, it will automatically test the connection for you, so you can see immediately if there are any problems.